I have a few friends who are morbidly obese. Having experienced the garden variety of obesity going through 60 pound weight fluctuations and trying to diet, I reached 240 pounds. 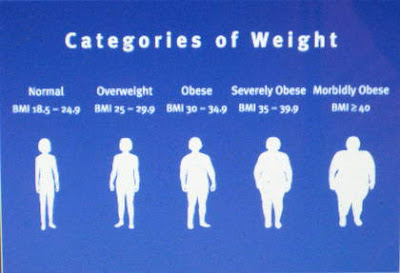 At 5'5.6" my BMI was listed on Table 2. That table was for the morbidly obese. My BMI was around 40. 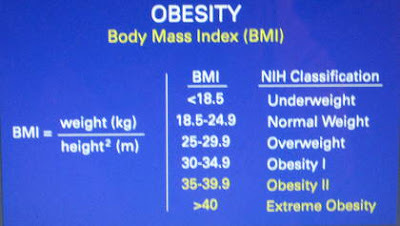 For my height, a normal BMI should be between 19-24. I was so out of control, but I couldn't get out from under the emotional, psychological and physical suffocation of my overeating. I loved to eat. And eat I did! So I understand what the obese are going through up to a point. Fortunately, I never experienced the physical disabilities my two friends experienced a good part of their lives, finding it difficult to walk or move. I remained active, though I was easily winded climbing 3 flights of stairs. I played tennis, but it was Doubles and I let others run the ball down, happy to cover half a court. My knees did ache. I had to take two Advils before and after I played. I had reflux when I overate and would wake up having aspirated food into my lungs. I had asthma. I also had yearly colds which developed into bronchitis as well as sinus infections. Still, I overate. I was addicted to gluten products like scones, pastries, pasta and especially breads. 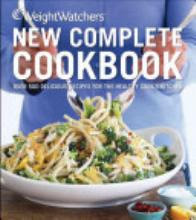 Weight Watchers didn't work for me. I used my own weight loss plan; no pills, nada. With my normal weight, 20-21 BMI, I can climb 5 flights of stairs without breathing heavily. I have won three tennis leagues in first and second place and I continue to enjoy great health and happiness. How are my friends? My friends are still obese even though two had lap band surgery. One lost about 60 pounds and the other close to 90 pounds, but they have gained and lost the same 10-30 pounds after the initial weight loss because they have learned to accommodate their lap bands; they graze during the day, eating foods that they can get down easily with the lap band. My morbidly obese friend has had hip replacement and now has to have knee replacement. My friend used a golf cart to get around because her hip had disintegrated from a combination of weight and arthritis. After the hip replacement she was better, but now her knees and back are going. Unless they can arrest their obesity they will most likely have to use handicapped motorized devices to get around indefinitely. They may even have to outfit a new accessible vehicle to accommodate their condition, especially if it becomes very painful or impossible to get in and out of a car. Many find such vans the only way to negotiate debilities safely, especially if individuals are not in large urban areas that have accommodating wheelchair buses or community accessibility conveyances. My friends are with it baby boomers and are not incapacitated. Handicapped accessible vehicles will provide hope for them to stay mobile and connected to friends and community in the next decade if they are unable to alter their current lifestyle path. An obese man with dangerous weight around his middle. My fear for both is the known complications that can arise from obesity like Type II diabetes, arthritis, high blood pressure, heart ailments (my friend needed a pacemaker at 61) and cancer. One high school classmate who had been morbidly obese and was walking with a cane when I last saw her had cancer and died. She was in her 50s. The downward cycle can happen quickly if one is relegated to a wheel chair after a limb amputation and one continues to overeat. A patient being treated for morbid obesity; a view of the foot and leg. Obesity is a disability in every aspect of one's persona (physically, emotionally, psychologically) and chronic overeating is not easily abated, especially in our culture where cheap available, convenient foods encourage weight gain because of their excessive amounts of fat, sugar and salt. Recently, I was interviewed by Raghavendra Purohit creator of the blog about healthy eating choices. I gave 5 interviews about (CLICK HERE FOR THE INTERVIEWS) healthy food selection, weight loss and obesity. In the third segment of the 5 part interview, I discussed how I had lost the weight and kept it off. CLICK HERE FOR THE INTERVIEW. My only hope for those who are obese and morbidly obese like my friends is that they can change their lifestyles and eating habits. It worked for me. But everyone must find his or her own pace then make their own decisions about their lives. Everyone's body and life path is different. Good post, Carole. Thanks for sharing your experience. 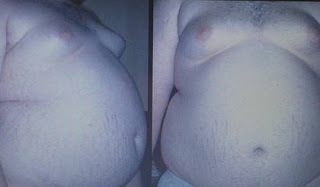 I've been slipping back toward obesity, after having done well for several years. I'm going to use your inspiration as fuel to get myself back on track! Great post Carole. Very scary stuff. It's almost embarrassing t admit that I've not had a problem...but I've always been a moderation kind of person. BUT...I have lots and lots of friends and family who struggle and my heart aches for them. Translating medical reports for mostly morbidly obese patients helps remind me why I have to try my best to remain healthy - even if I make it a point not to make my weight an issue. But it is scary to see all the stupid things that come from a sedentary lifestyle and poor eating habits. Yes, you know first hand of the relationship of overeating to disease. With obesity the diseases unfortunately multiply, the organs are pressured and the liver and kidneys have to work overtime to process the toxins and the devastating results from the excess fat storage. Keep up with your exercise and retrain your body to want less food. 28 days is all it takes to throw off any bad patterns you've gotten into. Thanks for the charts. They are very helpful. Yes, they are a quick reference so you don't have to go to the separate websites for BMI.